“We lost. We are not scoring enough points or making the play when we need to. I’m probably the most proud of them because there are some guys that are playing some real selfless football and stepping up in big situations, and fighting through injuries, playing through injuries and playing for guys through injuries. I can’t say how proud I am of those guys.” — Ben, post-game. A loss is a loss, except when you break the team record of one of the most hallowed members in franchise history, right? “It doesn’t matter to me,” said Steelers quarterback Ben Roethlisberger after he broke Terry Bradshaw’s team record for career passing yardage Thursday night in Nashville. Roethlisberger passed for 363 yards to give him 28,066 career passing yards in only his ninth season. Bradshaw compiled 27,989 passing yards in 14 seasons. Roethlisberger broke the record late in the third quarter on a 17-yard pass to tight end Heath Miller, whom earlier in the game had become the franchise’s third all-time leading receiver behind Hines Ward and John Stallworth. The performance by Roethlisberger marked the 12th time he’s passed for more than 360 yards in a game, also a franchise record. The lead eventually reached 23-16, but the Steelers fell short when Roethlisberger couldn’t move the team closer on a third-and-7 pass to an open Batch which left kicker Shaun Suisham with a 54-yard attempt that fell short prior to the Titans’ winning kick. You can read more from Mr. Wexell this morning here. You can also follow Mr. Wexell on Twitter here. On the day he vaulted Terry Bradshaw to become the Steelers’ all-time passing yardage leader, Ben Roethlisberger completed 24-of-40 for 363 yards, with one touchdown and one interception. He also ran once for 14 yards, and that converted a third down in the fourth quarter. His touchdown pass was an 82-yarder to Mike Wallace. You can read more from Mr. Labriola here. You can check out a few photos from the game here. 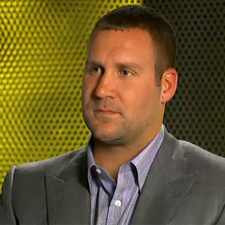 Check out Jamison Hensley’s blog, “Roethlisberger deserving of Steelers record” at ESPN.com. 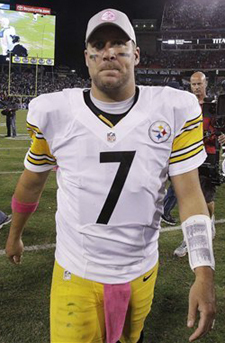 “On what has been far from his best night to this point, Roethlisberger is still deserving of this record. While Bradshaw put up his numbers in an age where the rules made it tougher to throw the ball, Roethlisberger is the more talented quarterback. He’s an accurate passer who can make all the throws and can carry his team.” — Jamison Hensley, from his blog. Ben was interviewed by Kurt Warner for NFL Network for the network’s Thursday Night Football lineup. The interview was part of the NFLN’s Pre-Game Show at 6:00pm, with more segments from the sit-down with Warner shown throughout the telecast. You can watch highlights from the interview here. “Ben’s a warrior. He’s always going to make big plays; we come to expect it.” — Isaac Redman, post-game.